A customer of ours, Alex, is looking to sell her daughter’s Frog 55 in Great Britain colours, as her daughter has now outgrown the bike. Alex and her family are an active family, so while the bike has been well used I’m told that the bike has been especially well loved by her daughter, and she was reluctant to part with it at first. However, now she is on a bigger Frog bike she’s ready to let her much loved Frog 55 go to a new home. The bike has been stored in a garage when not being used and the bike was originally purchased from Speeds Cycles around 3 years ago. 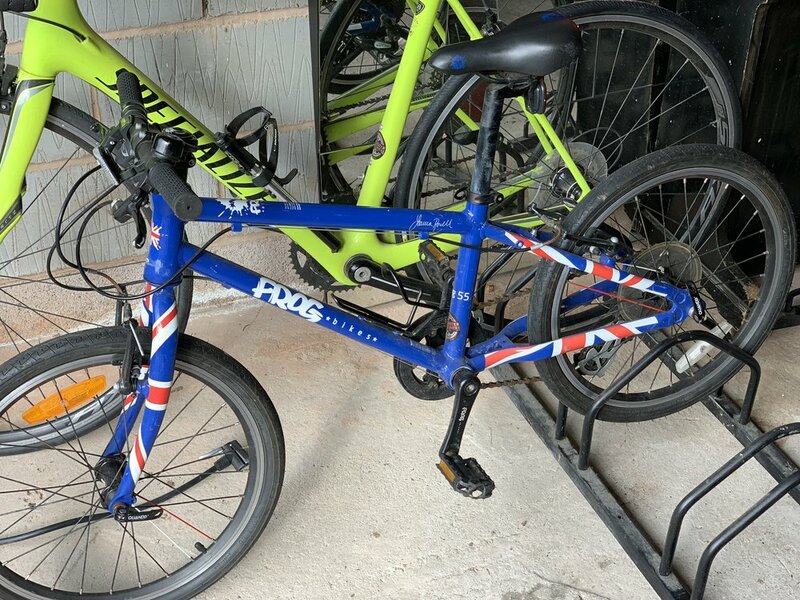 This is a potentially first great geared hybrid bike for a boy or a girl, and priced at just £250 ONO you can be sure that this lightweight bike with it’s serviceable Shimano components will have your child smiling for many miles. With regards to sizing, the bike is suitable for a 6-7 year old child with a minimum inside leg measurement of 55cms. If you’re interested in the bike please contact Alex directly on 07969484953.